This Commercial Sign Supply On Sale Is a Mid-Air Advertising Kit! This Sign Supply Displays Posters and Industry Advertising Above the Crowd! Buy At SignSupplies2Go.com! This sign supply kit features ceiling suspension hardware. 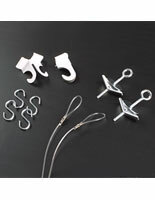 The hanger clips are designed for locations with suspended ceilings. Establishments with ceilings made of plaster and lathe, or of sheetrock, will find the toggle bolts perfect for suspending displays. This sign supply, hardware kit provides business owners with an alternative to wall frames, whether of cheap plastic or heavy metal. 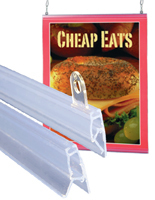 The hangers in this kit are simple to install or replace, and produce eye-catching displays. This chain and hook method is gaining preference over wall frames as a means of attracting customer attention. By making it possible to suspend posters and advertising from ceilings, this sign supply kit frees up wall space for other marketing displays. 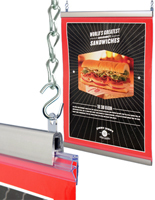 Department stores and grocery markets find this chain and hook method ideal for raising awareness of new products, or as a way to keep customers current on special offers and floor layouts. 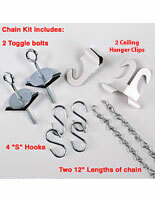 If your location requires a longer chain, it's available among our many other chain and hook kits. 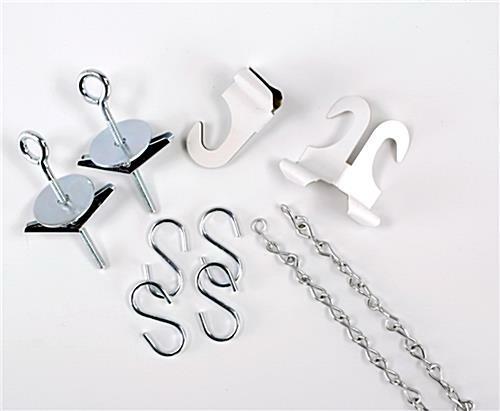 This sign supply includes all the hardware elements used to suspend posters and banners from the ceiling. 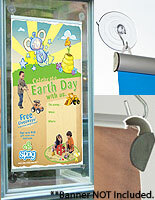 These hardware components are designed for compatibility with our banner and poster hangers.